Diablo Blend by local favorite Caffe Ladro may sound scary and intimidating, the "Devil" Blend, but if you like it big and bold then this is your new brew. If you are transitioning from large commercial coffee conglomerates who notoriously burn their beans then this carefully prepared Dark Roast is a great selection. Upfront and in-your-face flavors announced on the bag of 'Tobacco Leaf, Brown Sugar and Dark Chocolate' were present. This strong Fair Trade and Organic Certified Dark Roast has a big-body and that's the way we like it! If you like Middle Fork Roasters Tough As Nails Blend then put this in your pipe and smoke it. Or actually, put this in your Bonavita and brew it! Sometimes roasters go crazy trying to make coffee that is dark as night but it turns out to taste like motor oil and look like worcestershire sauce. This is an example of restraint. Sure, Caffe Ladro made it big and bold, but it is also good to the last drop. The SCG Crew supports coffee experimentation. 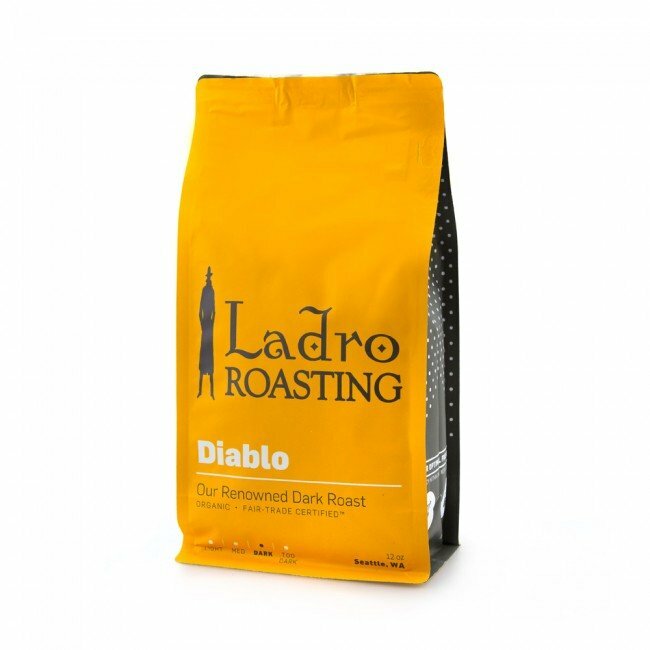 We have tried mixing Caffe Ladro 75% Diablo Blend with 25% Fremont Blend for a special little in-house brew we like to call 'Devilment.' Your proportions may vary!